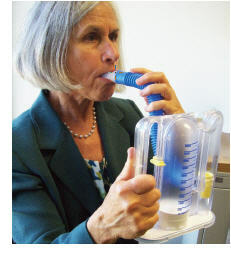 An incentive spirometer is a device that measures how deeply you can inhale (breathe in). It helps you take slow, deep breaths to expand and fill your lungs with air. This helps prevent lung problems, such as pneumonia. An incentive spirometer is a device used to help you keep your lungs healthy after surgery or when you have a lung illness, such as pneumonia. After surgery, it may be too painful to take deep breaths.